Wind powered water pumps have been a feature of the American Mid-West for well over a century. The earliest examples were made of wood which were eventually replaced by the mass produced steel prototype represented in this kit. Nearly 6 million of this prototype were manufactured by the Climax Corporation. This all brass kit includes the well sleeve and piping shown. The completed model measures 3” high, 1/4” x 1/4” at the base and 3/4” x 1 1/4” at the top. 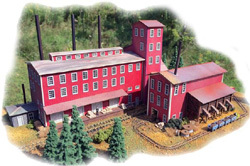 This kit is based on a pair of retail coal structures that still stand in Williamstown, Massachusetts. Though the exact date of their construction is unknown, we estimate that they were originally built in the late 1800’s or early 1900’s when coal was the primary source of fuel for heating homes and powering businesses. This kit serves as a representative of lumber mills that existed in California, Idaho, Minnesota, Oregon and West Virginia from the 1890s to today. The kit takes the most interesting elements from each of the prototypes and blends them into one. This plant was first opened in 1935 by the Escondido Orange Association and continued processing citrus fruits until 1987 when it was closed by the Paramount Citrus Association. Oranges and lemons were trucked to the plant in 55-Pound field boxes that were unloaded at the loading dock on the rear of the plant. Processed fruit was shipped in reefers via the rail spurs located on both sides of the plant which were serviced by the Santa Fe Railroad. A prototype Color Photo Sheet has also been included to be used as a reference for coloring and “modernizing” this structure. The laser-cut self-stick “American Bond” brick and slate pieces featured in this kit are created from our Model Builder’s Supply Line styrene building sheets. In addition, the foundation pieces are created from Taskboard®, a new wood fiber building material that is also part of our Model Builder’s Supply Line. Burlington Marble & Slate was inspired by slate, limestone, blue stone, granite and marble finishing mills that existed across the United States since the early 1800’s. The use of these materials declined and by the middle of the 1900’s many of these mills were closed. Blocks of stone are brought from the quarry on specialized wagons that ride on a narrow gauge track system (M-TRAK). Finished products including headstones, shingles, columns, and stone work are shipped directly via rail car or to another loading point via the narrow gauge railway. M-TRAK and the scenic details shown are available as part of our “Making-A-Scene” product line. The laser-cut stone and shingle pieces featured in this kit are created from our “Model Builder’s Supply Line” styrene building sheets which are available separately. N Scale model measures approximately 14″L x 6″W x 3″H. This kit represents the Gruber Wagon Works as it was in 1904 at which point the power source for it’s internal pulley system was a Otto gasoline engine. Though this Gruber Wagon Works kit does include a dock and ramps for loading wagons onto railcars, the prototype was never served by a railroad. This kit includes an option for excluding this loading dock and includes longer ramps for lowering wagons from the second floor paint shop (the final stage of the production process) back down to ground level. In case you were wondering… the paint shop is on the second floor because of the dust from the adjacent dirt road ! Should you wish to add buggies, wagons, carriages and other details to your completed model, please visit the Detail Parts and Shire Scenes sections of this web site to see dozens of detailing and vehicle items. Finished model measures: 7¼”L x 6″W x 2¾”H. X-Cel purchased the mill in 1965 and converted it to a feed only plant that is still served by rail and bulk trucks today. 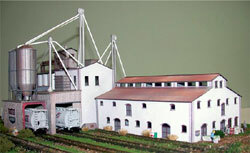 Though this kit is based on a specific prototype, its design is typical of large feed mill complexes that still stand across the United States. All of the individual structures included in this kit are fully supported and most can be placed in virtually any location to accommodate the space available on your layout or module. The elevator towers can also be positioned to suit the modelers preferences using the nearly four(4) feet of piping included in this kit. The sacks, sack stacks, barrels, barrel clusters, hand carts and figures shown on the label are available separately as part of our Making A Scene detail parts line. Finished model measures: 16″L x 8″W x 6″H. The ‘Conway Roundhouse’ kit was inspired by the roundhouse still in use by the Conway Scenic Railroad in North Conway, New Hampshire. This structure has been expanded and extended over the years into its current four stall version that provides one 7″ length stall and three 5″ length stalls. The longest stall will house a Mikado with tender, F-Units or E-Units and the other three stalls will hold yard and road switching locomotives such a S1s, RS11s, RS2/3s, and SW9/1200s. The kit instructions include plans for track placement inside and outside of the round house using approximately one piece of 30″ flex track (code 80 or less is recommended). This round house can be used with turntables with 5.5″ to 10.375″ diameters including those from Kato, Walthers, Heljan, Peco, Atlas, and Bachmann. This laser-cut micro-plywood kit features step-by-step instructions which include scale drawings and assembly photos. The finished model measures 7-3/4″ W x 7″ D x 2″ H. The track center lines shown on the floor plan are based on a 10.375″ (130 Scale Feet) diameter turntable and can be adjusted to suit smaller diameter turntables by modifying the track angle or the roundhouse orientation. This kit is the first in our new “Trackside Series”. This series of kits feature easy-to-build laser-cut structures, repurposed rolling stock from major manufacturers, custom detail parts and prototypical decal sheets and full-color sign options. This Locomotive Sanding Facility kit provides an essential service for your steam or diesel locomotives from the 1940’s to the current era of yard operations. It includes a PS-2 covered hopper (with trucks & couplers) in various road names for sand storage, a decal sheet with prototypical sand service markings, a two-track sanding tower with piping & valves and a laser-cut sand drying house kit. Based on the standard configuration shown, the completed model measures approximately 7.5″ long x 2.5″ wide (including piping & covered hopper). This “Baggage Car Diner” kit includes a re-purposed PS 72′ baggage car (with trucks & couplers) as a kitchen which is attached to a laser-cut diner kit. This kit features multiple full-color sign options, custom roof details, and full-color window glazing laser printed with the modeler’s choice of interior diner scenes or mirrored glass. Based on the configuration shown, the completed model measures approximately 5.5″ long x 2.5″ wide (including baggage car). This kit is the fourth in our new “Trackside Series” which feature easy-to-build laser-cut structures, repurposed rolling stock from major manufacturers, custom detail parts, prototypical decal sheets and full-color sign options. This “Diesel Fueling Depot” kit includes a repurposed 11K Gallon Tank Car body, pump house, concrete supports, two(2) fueling cranes, anchor blocks and over two(2) real feet of piping. Based on the configuration shown, the completed model measures approximately 10.50″L x 3.00″W. At it’s peak Elkton had over 3,000 residents and was served by three railroads, the Florence & Cripple Creek, the Midland Terminal and the Colorado Springs & Cripple Creek as well as an electric street car line. Today, remnants of this once bustling town can still be found just north of Victor, Colorado. The completed display measures approximately 13¼”L x 8″W x 5½”H. MTRAK Nn30 track system and vehicles as well as the other scenic detail parts shown are available separately. This kit is the ninth in our TRACKSIDE SERIES which feature easy-to-build laser-cut structures, re-purposed rolling stock from major manufacturers and custom detail parts. This “Flat Car Bridge” kit includes a re-purposed flatcar body and photo-etched railings along with laser-cut concrete abutments, wooden trestle supports and tread options to support rail or vehicular traffic. The completed model shown measures approximately 5.75″L x 1.00″W x 1.50H”. Vehicles, trains and track not included. stonework pieces created from our Model Builder’s Supply “Random Cut Stone” (#50047) building sheets. full-color sign sheet which features some of the most popular pickle brands. a full set of scale drawings and in-progress photos. The finished model measures approximately 8″L x 9″W x 4½”H. a service deck, frame supports and stairway. The finished model covers an area of approximately 3¼” x 3″. 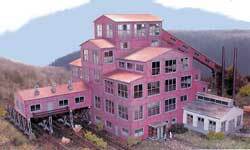 The Grover Cleveland Mine is a composite of several small mining operations dating from the 1930’s to the 1960’s. These mines varied in the minerals that they produced ranging from coal to precious metals. The Head Frame allows ore to be pulled up from the mine shaft using a steam engine located in the Hoist House. This ore is then pushed in a Mine Car by men or pulled by horses on a mine track via the Shaft House to the Gantry. At the base of the Gantry, the Mine Car is hooked to a cable and then pulled up to the load-out area where it is dumped into a hopper car that will be taken to the local processing mill. Waste rock is routed over another mine track and dumped into a tailings or culm pile. Standard Configuration measures 1¾”x 8¾” and Optional Configuration measures 5½”x 5″. Includes all figures & vehicles shown. Typical of roadside garages found along American highways from the 1930s to the present. Includes a variety of signs from different eras and plenty of castings to add junk to the scene. For decades, railroads moved milk from country collection points like this to bottling plants in big cities. This charming building makes a great trackside industry in a small town and some were freestanding operations alongside the tracks as well. Includes covered pull-through can unloading/loading area, smokestacks, roof vents and more. Ideal as a trackside freight house, road-to-rail transfer or trailer-to-trailer reload facility, this kit has lots of versatility and is based on a prototype built in the 1950s. Two rail loading platforms are included that can be placed as needed alongside the structure, or use the modern “rubber bumpers” that are provided for a modern truck terminal. The prototypes that inspired this kit were located in the anthracite coal region of Northeastern Pennsylvania. In these immense structures know as “breakers” or “collieries,” anthracite was washed & broken into sizes usable for home heating & industrial processes. Breakers of the size and type represented by this kit were typically built in the 1930s to consolidate several smaller, older processing plants and many were still operational into the 1970s. At their peak, there were hundreds in operation and the several thousand employees that worked in them could process as much as 12,500 tons of coal in a single day. Coal was brought to the breakers for processing from the surrounding mines via extensive railroad lines and conveyors that could literally stretch for miles. A superb trackside industry for any era, this kit includes window glazing with mullion detail, and numerous custom castings, including the large brick chimney and feeding troughs. No matter what they make, this is a great industry for any town along your layout. Model can be built as a freestanding building, or as a partial structure for use along your scenic backdrop.